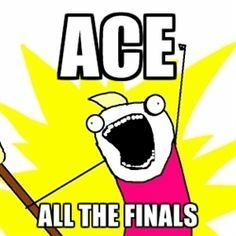 We hope you guys are ready to rock your finals. Never fear if you aren’t, for the next two weeks, Monday – Thursday, the library will be open from 7AM – 8PM! The library has a quiet study room, single study carrels, group study tables–seeing a theme? Feel free to come in and study late with us. And these categories all learn differently–and need to study differently. Make and use flashcards — don’t forget to shuffle! Use word association or mnemonic devices! Translate charts, diagrams, and maps into verbal or written summaries! Establish a Study Zone in your room or house — a place where you will be productive, put away your phone, and stay off of Netflix! Chewing gum gets more oxygen to your brain, which makes your brain work faster! Make a schedule–and don’t forget to schedule in breaks! Science says that it takes 25 minutes for your brain to fully focus and recommend 45 minutes of work, and 15 minutes of brain rest. Set a timer and get to it!